The weather out side is nasty and winter still has us in its grasp, but now is a good time to think about spring and what all the snow and cold a and wind has done to your siding during the winter. Now is also a good time to look for sales on pressure washers since it is the off season. Here are a few easy to follow steps to help you clean you vinyl siding when you are ready. Cleaning the vinyl siding of your home is a great way to keep your home looking beautiful and to keep the value of it high. Rather than needing to scrub every inch of your siding by hand, a pressure washer is a great tool to use. In order to do a thorough cleaning job and to ensure that you do not damage your siding, there are some steps you should take. 1. Choose the right pressure washer and amount of pressure. There are a number of different types and sizes of pressure washers out there, so it can be difficult to decide which one is the best one for you to use. You can use either an electric or gasoline run pressure washer as long as it has at least a 3,000 PSI pressure rating with a rate of flow that is at least 4 gallons. This will give you both the pressure and amount of water you need to thoroughly clean your siding. You will want to add your cleaning solution to the reservoir and set the sprayer to low pressure. When you are looking for your new power washer (pressure washer) make sure to tell the sales folks that you intend to use this for siding washing. Have them explain the cleaning solution (soap) holder and how it works. Keep in mind that your new pressure washer will have many other uses then just cleaning your siding. Sidewalks, decks, gutters garage floors and even your car can all be cleaned with a power washer. Steel and wood siding can be cleaned as well but you will want to use caution because the washer will etch into the wood and remove the stain. siding can be Different nozzles have different uses. Each nozzle has a different amount of pressure it releases as well as the spray pattern it produces. Here is a nozzle chart showing the different nozzles and there impact. 2. Prep the area you will be cleaning. * Move any patio furniture, flower planters, or any other objects that may get in your way. * Cover any plants you have outside to protect them from damage as well as to prevent them from getting any cleaning solution on them. * Cover any electrical wiring or outlets you have outside. * If you see any mold that is growing on your siding, you will want to remove this first with a bleach and water mixture. 3. Test the water pressure first. Before you begin cleaning a large area, test the amount of pressure you are using on a small area. 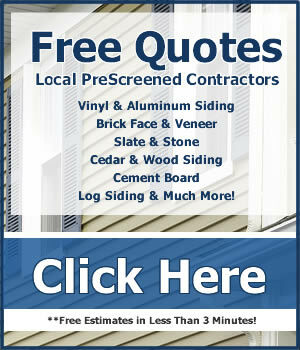 You can easily change the amount of pressure you are using to ensure your siding will be cleaned. Normally the soap application is done under low pressure then you switch to a higher nozzle (25 degree) and use that to wash off the soap and clean the siding. 4. Use a steady motion spraying back and forth. To ensure that all areas are thoroughly cleaned, you will want to spray the siding from left to right in a steady motion. 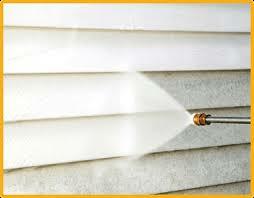 Keep the angle of the sprayer at about forty-five degrees to prevent water from getting behind your siding. After you have washed your vinyl siding with soapy water, you will want to rinse it to avoid streaking. Ensure that you rinse it within just a few minutes of washing it so the cleaning solution does not have a chance to dry. I tend to start at the bottom and work my way up it seems to reduce streaking.